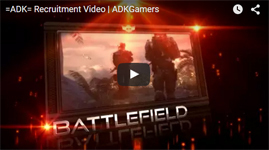 =ADK= is a gaming community focused on being a FUN place for it's members & guest's to make friends, meet, hang out, discuss and play video games. We TRY to have very relaxed set of rules but due to how each game/service we have to offer for your use each game/service does/might have different set of rules. In addition to the general rules above, each server and/or game section has a different set of rules depending on what is being offered at the time, please see the appropriate section for its rules. The below Code of Conduct covers some of what was listed above in a more detailed manner. All ADK Members and Registered Users are expected to read and follow the Code of Conduct at all times. There is no requirement on skill level to be an ADK Member or Registered user of this community. The Chain of Command must be followed at all times. If you feel that a problem or issue has not been resolved with the Chain of Command you are able to go to a higher ranking staff member. Public flaming of any ADK Member or guest is not allowed on the forums or Discord and could result in a kick or ban. If you have an issue with an ADK Staff Member or Registered User of the community, please follow the chain of command. Anyone found poaching members from the community will immediately be banned and removed from the community. Typically this only happens from members that try to impact the community in a negative manner, by providing false and incorrect information about the community. While on Discord we ask that you use PTT. While we are very lenient on it, if someone asks you to fix your hot mic'ing, please respect those in the channel and look at fixing your sensitivity. Any ADK member found cheating or hacking will be removed from the community with the chance to appeal to prove against the evidence that was found. Any registered user to the community found cheating or hacking will be removed from the respective game server in which they were found hacking / cheating. All ADK Members and Registered Users are responsible for their own actions. ADK Members and guest should refrain from discussing topics that could potentially turn into a heated conversation. If you do get into a heated conversation with someone please inform a Community Manager or Founder as soon as possible so we are not blindsided by any possible issues. We are a Gaming COMMUNITY. We will always be a community and will always try to expand to as many members as possible to try to create a fun gaming environment for all. Please do realize that we will always be gaining members, and there will be times when you might not know everybody. Some people make that out to be a bad thing, but it's a part of the gaming community atmosphere. So if you are looking to become an =ADK= Member, you must understand and realize that things will constantly be changing in the community. If you don't like the constant growth of the community than it might be best to look for a clan to be a part of as we look to connect with as many players as possible. We proudly uphold the right to free speech. Please remember however that it is -a right-. We will not sit in our servers and police them for people saying bad words. But if people get out of hand we do ask them to calm down/stop per the rule-set of the game/service being offered. If people join the server/service being offered, and cannot follow our list of rules for that server/service on top of using every word known to man, then we will kick and/or ban the person who is causing the problems. If an issue truly does arise you can always contact an admin of that section/service to take care of the situation. There are ways to contact us through the servers as well, so please make use of that feature if you ever need to contact us!